Thank you for finding out how you can help us make Christmas better. More and more people are using food banks and we can’t imagine how hard it must be when you’re struggling to put food on the table for your family at any time of the year, let alone at Christmas. As a family firm, we’ve made a commitment to make this Christmas better for disadvantaged families and we hope you’ll join us. All you need to do is collect food and gift items which can then be donated to a local food bank or charity. Together, we’ll make a massive difference. Of course, we’d like to give something back to you for helping so we’re launching a Bingo Box challenge. If your team collects all the items on our Bingo Box card, we’ll enter you into a prize draw. • Why not get a bit of healthy competition going by challenging other departments or companies to achieve a ‘full house’ first? • Implement a ‘bah humbug’ policy so anyone being grumpy about Christmas has to drop a donation into the box! • If you’re ordering Christmas goodies for your team, why not order an extra one or two for the box? • Donate to the box in recognition of someone who has been a key part of your business this year (maybe a customer who helped you with a case study or recommendation, a supplier or a member of your team). Don’t forget to tweet about it using the hashtags below! We have a list of items commonly needed by food banks at this time of year. 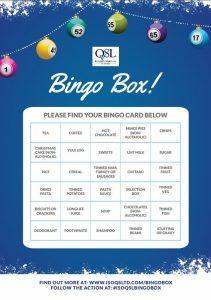 Whether you’re donating a few things, or doing the ‘full house’, you won’t go wrong if you buy from our Bingo Box Card (click to download). We’d love to keep in touch with you (and Tweet about your support) so please email your name, company name, email address and Twitter handle to marketing@isoqsltd.com if you’re taking part. We’re only a small company so unfortunately we’re only able to offer to collect boxes from companies in the Worcester area. If you’re outside the area, we’d love you to take part but you’ll need to take your box to your local food bank.